NORTH ANDOVER, Mass. 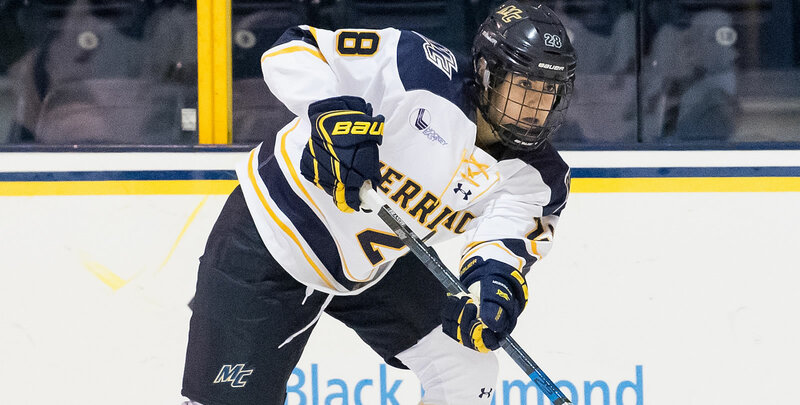 - The Merrimack College women's ice hockey team fought out of a two-goal deficit Friday night to tie Providence College at home, 2-2. Sophomore Megan Fergusson netted the equalizer with less than two minutes left in regulation, keeping the team tied for fourth place in Hockey East standings. The Friars scored two straight goals within minutes of each other in the first period, and took a 2-0 lead through the first period and into the midway point of the second period. The Warriors had the only goal of the second period when sophomore Courtney Maud scored her second of the season, cutting the Friar lead in half. With under two minutes remaining in the third, the Warriors tied things up at two. Sophomore Megan Fergusson finished off a pass from senior Paige Voight, forcing overtime. Ridgewell gave up two goals, stopping 15 shots in the tie. Goal #1 (1-0 PC) - The Friars got on the board just seconds after killing off its first penalty of the day. A great feed from Maureen Murphy left Hayley Lunny wide open, and she didn't miss her chance on a wide-open net to get Providence on the board. Goal #2 (2-0 PC) - Providence doubled its lead with seven minutes left in the first. Emily Landry tipped in a shot during a five-on-three, putting the visitors in command early. Goal #3 (2-1 PC) - The Warriors got one back at the ten minute marker of the second period. Senior Katelyn Rae fed sophomore Courtney Maud, who cut the lead in half. Goal #4 (2-2) - With just under two minutes left, Merrimack tied the game. Sophomore Megan Fergusson tallied her ninth of the season on a feed from senior Paige Voight. - Merrimack has now played in seven overtime games; the team is 0-2-4 this season. - The Warriors forcing overtime proved to be just the third overtime game for the Friars, and the first tie of the season. The Warriors are on the road next weekend, playing both UNH and Northeastern.